*1970 - 1979 There are 105 products. 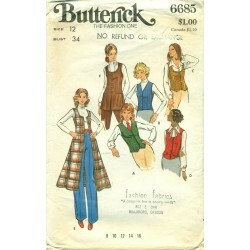 Sew a women's vest with this sewing pattern from Butterick and the 1970s! 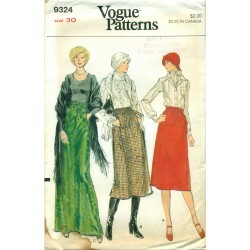 Three different lengths - below the knee, hip and waist. Scoop and V-neck styles. Flaps, patch pockets, and several different types of hems. Many different choices and options. 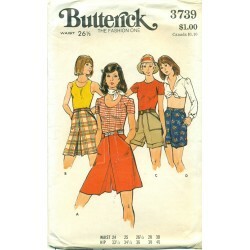 You can sew a nice pant suit with this vest pattern from Butterick! 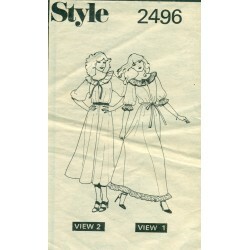 Pretty 1970's style with this dress pattern from Style! Instructions only for pattern No. 2496. 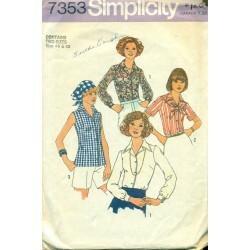 Elbow length sleeves with or without a ruffle. Ruffled neckline. Below the knee or ankle lengths. Cinch in the waist with a belt or tie. 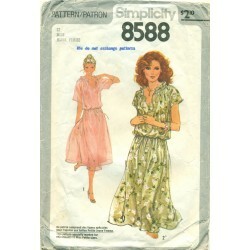 If you have the pattern, these instructions will help you sew this vintage dress from Style. Cute girl's hippie style, maxi dress and smock top in both long and short sleeves. 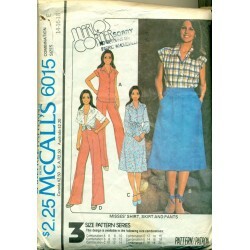 This vintage sewing pattern is from McCall's and the 1970's. 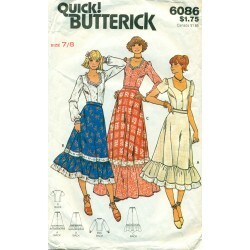 Dress up the yoke with ribbon or your own embroidery for a special touch! 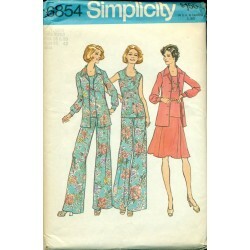 Simple, but elegant this is a terrific sewing pattern from the 1970s and from Simplicity! Tucks and tie around the neckline add accent and frame your face. 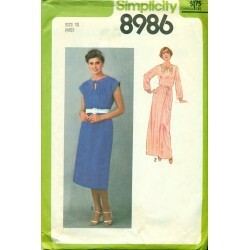 Comes with a tie belt you can sew in contrasting or matching fabric. Long or short sleeved. Large to x-large size. 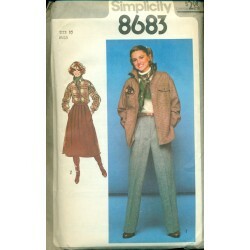 This vintage sewing pattern from Simplicity features wide leg, bell bottomed pants, scoop necked blouse which zips up the back, a light jacket which buttons up the front and would make a terrific shirt itself and flared skirt. 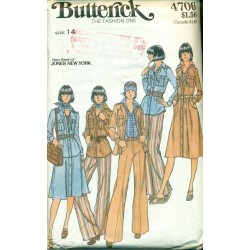 Fun and unique styling from the 1970's! 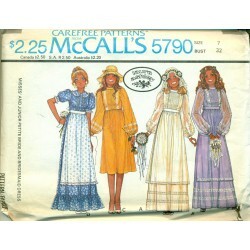 Designed by Laura Ashley, this McCall's sewing pattern has several versions of dresses for the bride and bridesmaid. High waisted with flowing full sleeves and plenty of ruffles and rows of lace. Very vintage and very pretty for that special occasion! 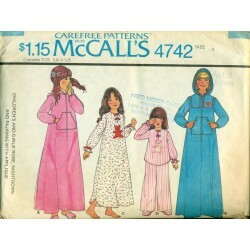 Sew a cute nightgown or pair of pajamas with matching robe with this vintage sewing pattern from McCall's. The robe, which zips up the front, has a hood and pockets. All have long sleeves and will help keep any little girl warm - all while looking so cute! 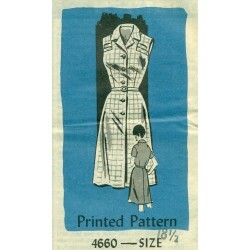 You can sew several different outfits with this vintage sewing pattern from McCall's! The dress doubles as a jacket and a shirt. Finish it off with a pair of shorts, pants or halter style top. The little girl in your life will be delighted! 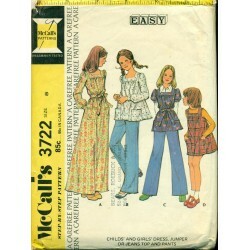 Shirt style dress, skirt with pockets, button front shirt and 1970's style pants are all included in this vintage sewing pattern from McCall's. Marlo's Corner--designed by actress Marlo Thomas. Versatile styling for career wear or more casual wear. Three sizes included. 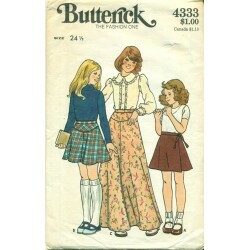 Three styles of skirts you can sew with this vintage pattern from the 1970's, made by Butterick. Two styles of the skirt have a yoke and gore style in both above the knee and maxi styles. Another skirt is a wrap around style. 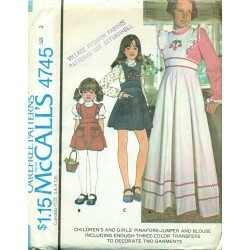 What cute fashions you can sew for the little girl in your life! This versatile, vintage sewing pattern for little girls has several versions of a peasant dress - sleeveless, long or short sleeve. Doubles as a great smock top for her too. 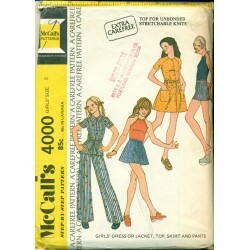 Also includes instructions for pants with comfortable elastic waist. 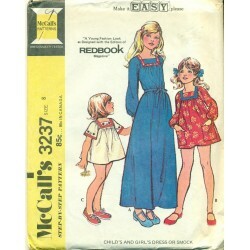 From McCalls and the 1970s.